What’s all this about Jesus in the Old Testament? And does it really matter? In the wake of last weeks' posts about Abraham and Moses, a friend asked me about why I think the Old Testament is a book about Jesus. Now, when I say the Old Testament is a book about Jesus, I don’t mean in the vague ‘all OT sermons have to eventually get to Jesus in the last three minutes’ sort of way, but as in really a book about Jesus. (For some reason lots of people are quite alright with the former option, but think that the idea that the Old Testament would actually be a book about Jesus is rather exotic.) Anyway, I thought it was, not only a good question, but an important question, so thought I’d lay out my case today. On the day of His resurrection, Jesus walked to Emmaus with two of His disciples, and as He walked, ‘beginning at Moses and all the Prophets, He expounded to them in all the Scriptures the things concerning Himself’ (Luke 24:27). Jesus didn’t just point out a few Messianic prophecies, but rather He taught His disciples about Himself ‘in all the Scriptures’. So that means that the Scriptures (and here it’s specifically the Old Testament that Jesus is discussing with His disciples, as the New Testament hadn’t been written yet), don’t just occasionally prepare the way for Jesus with a smattering of prophecies here and there about Him; no, the Scriptures are all about Jesus. He is the theme of the book. That’s how Jesus taught His disciples to read the Old Testament on that Resurrection day, and we as His disciples today shouldn’t forget that lesson either. 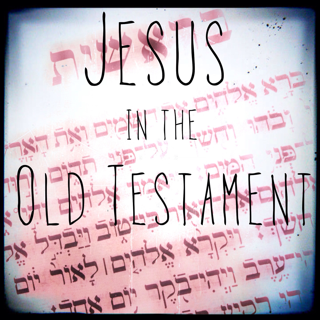 Important as the example of how Jesus taught the Old Testament to His disciples is, it’s not the only reason we have to see that the Old Testament is a book about Jesus. At the beginning of John’s Gospel we read the clear statement that ‘No one has seen God at any time. The only begotten Son, who is in the bosom of the Father, He has declared Him’ (John 1:18). ‘No one has seen God at any time’! But what about all those people in the Old Testament who saw God? Adam and Eve walked with Him in the Garden. ‘The LORD appeared to Abram’ (Gen. 12:7) (as did the Word of the LORD in Genesis 15 and the Angel of the LORD in Genesis 22). Abraham ate with the LORD in Genesis 18. Jacob wrestled with the LORD (Gen. 32:30). ‘The LORD spoke to Moses face to face, as a man speaks to his friend’ (Ex. 33:11). Moses, Aaron, Nadab, Abihu and the seventy elders of Israel saw the LORD and ate and drank in His presence (Ex. 24:9-11). And those are just a few examples from the first two books of the Old Testament! How does that fit in with John 1:18? Well, John 1:18 doesn’t only tell us that ‘no one has seen God at any time’, it also tells us that ‘the only begotten Son, who is in the bosom of the Father, He has declared Him.’ In other words, it’s God the Father whom no one has seen at any time, but He can be truly known because God the Son reveals Him. So all those people who saw God in the Old Testament saw God the Son. Jesus appeared to them, for God always reveals Himself in the person of the Son. Jesus has always been, and will always be, the revelation of God. No one ever comes to the Father except through Jesus. But let’s go back a bit further in John’s Gospel to the very first verse. ‘In the beginning was the Word, and the Word was with God, and the Word was God’ (John 1:1). Now, what’s that got to do with reading the Old Testament, you ask? Is it just because the Old Testament begins with the words ‘in the beginning’? It’s true that that’s important, but it’s not what I’m getting at here (we’ll come back to that later when we think about the Trinity). What I’m getting at here is the Son’s identity as the Word. John wasn’t suddenly coming up with a new designation for the Son, nor was be borrowing concepts from Greek philosophy. No, John’s pointing out to us something deeply rooted in the Old Testament about who the Son is. The Son is the Word of the LORD, and the Old Testament is full of the Word of the LORD. I wrote about the appearance of the Word of the LORD to Abram a few days ago, so let’s take another example today. Think about the boy Samuel in the tabernacle in 1 Samuel 3. The chapter starts off by telling us that ‘the word of the Lord was rare in those days; there was no widespread revelation’ (1 Sam. 3:1). Then the LORD comes and calls the boy Samuel during the night. But this wasn’t just a voice – ‘Now the Lord came and stood and called as at other times, “Samuel! Samuel!”’ (1 Sam. 3:10). At the end of the chapter then, we have a summary of Samuel’s ministry, ending with the words, ‘the Lord appeared again in Shiloh. For the Lord revealed Himself to Samuel in Shiloh by the word of the Lord’ (1 Sam. 3:21). This summary points back to how the LORD appeared to the boy Samuel that first time, and putting it together we see that when the LORD appeared to Samuel, it was the Word of the LORD who appeared to reveal the LORD. And John tells us that that Word of the LORD is Jesus. In John 5, Jesus gives a lesson in hermeneutics to the leaders of Israel who were seeking to kill Him. What’s Jesus telling these scribes? First, He tells them that eternal life is found in Christ, so eternal life can only be found in the Scriptures when we see Christ in the Scriptures. He’s telling them that they’ve missed the point. They have great knowledge of the words of Scripture, but they refuse to recognise what it’s really saying. They refuse to recognise that it’s a book about Jesus and come to Him for life. Then, Jesus goes on to tell them plainly that Moses wrote about Him. And verse 47 is perhaps the most striking of all here, for Jesus tells them that they haven’t believed Moses. Now, these are good, Bible-believing, Scripture experts He’s talking to, yet He tells them they haven’t believed Moses! How have they not believed Moses? Because they haven’t believed Jesus, and it was Jesus that Moses was writing about. Jesus is saying that to truly believe the Scriptures, we’ll see Christ in them and come to Him for life. To truly understand and believe the Old Testament is to recognise it as a book about Jesus and trust in Him. Right at the end of the Bible we learn something very important about the purpose and nature of prophecy. And, as the Old Testament contains a lot of prophecy, this is quite relevant to how we read the Old Testament. In Revelation 19, the angel has shown incredible things to John, so much so that John falls on his feet to worship him. But the angel is quick to stop him, telling him, ‘Worship God! For the testimony of Jesus is the spirit of prophecy’ (Rev. 19:10). The angel is telling John that the point of prophecy, the point of all the marvellous things he has shown him, is to testify to Jesus and so to bring glory, not to angels, messengers or prophets, but to Jesus alone. But the angel doesn’t just say that the testimony of Jesus is the spirit of this particular prophecy. No, the testimony of Jesus is the spirit of all prophecy. And that includes the Old Testament ones. Old Testament prophecy testifies to Christ, points us to Christ, and glorifies Christ. Our God is the Triune God. And Trinity is not some minor attribute or some temporary way of being, but rather the very essence of who He is. And so right throughout the Old Testament, the God about whom we’re reading is the Triune God. So when we read, ‘In the beginning God created the heavens and the earth’ (Gen. 1:1), the God who created is the Triune God. And so that means that Jesus doesn’t suddenly appear on the scene in the New Testament out of nowhere! Yes, the Incarnation is something different, but it’s not the beginning of the Son. To read the Old Testament without seeing Jesus is essentially to de-Trinitarianise it. And to de-Trinitarianise it would be to make it about another god altogether – not the true and living God, but a god of our own imaginations. So, there we go, 6 reasons to read the Old Testament as a book about Jesus, which are also 6 reasons why it matters.